Armor of Adaptation is a full bodied wearable kinetic metal sculpture, which embodies and strengthens the identity of artist Rosary Solimanto as an intersectional disABLEd woman. This piece is uniquely tailored to her health conditions, surgeries, and diseases (from multiple sclerosis, endometriosis, hypothyroid, arthritis, 8 surgeries and a bone marrow transplant). Armor of Adaptation is constructed from forged steel, which is bent into interlocking shapes, which will be viewed as a suspended form. 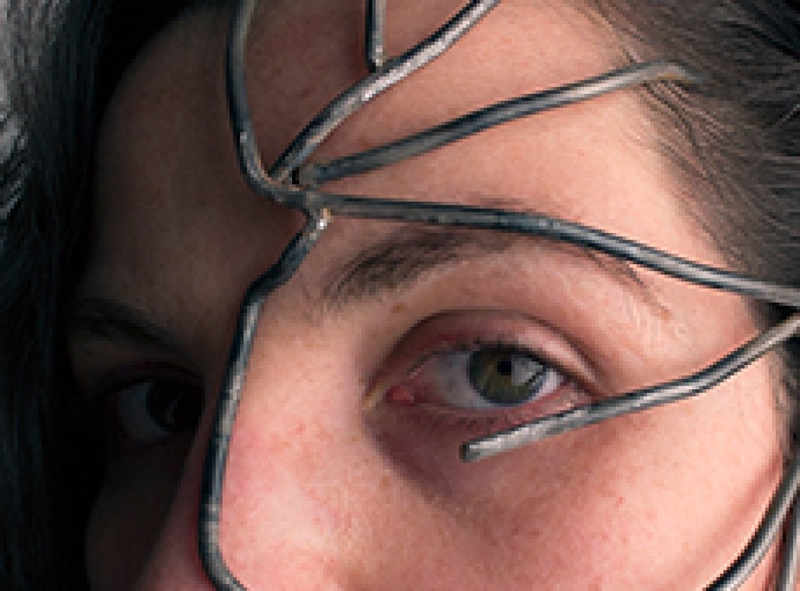 The wearable sculptural work will accompany large-format photographs of the sculpture being worn in performative poses related to her health conditions, all are invisible, as are 80% of the people with disabilities. Invisible disabilities are the most controversial, stigmatized as they are not seen, only felt. More women than men have autoimmune diseases, chronic health conditions, and disabilities. The goal of Solimanto’s work is to advocate disability pride and awareness to women with health conditions, to feel alluring and empowered. The language utilized in society and by the medical community surrounding disABILITY identity is negative and deconstructive to the human mind and society. The title of the work is derived from her view on disABILITY as it being an “adaptation” incurred due to stressors which have incurred in and/or on the body, either in utero or in life. A positive connotation and empowering language such as “adaption” instead of “disability, abnormality, disfunction, etc,” allows for people with health conditions to view themselves and others with adaption/s as a human identity which will be positive and uniquely beautiful. Rosary Solimanto is best known for her interdisciplinary activist based work which explores the objectification and stigmatization she faces with multiple sclerosis. She encourages discourse on disability identity to unfold to empower the disabled. Solimanto is an emerging artist who exhibited in New York City, New Jersey, North Carolina, Seattle, Pittsburgh, Hudson Valley, Connecticut, Minnesota, Toronto, Germany and Spain. She has performed in the O + Festival in Kingston, NY, The International Human Rights Art Festival In New York City, the Itinerant Festival at the Bronx Museum and Socrates Sculpture Park, a 12-hour durational performance at the Nuit Blanche Festival in Toronto and exhibited and/or performed at nine international museums. Awards include Parnassus Award in Fine Arts at Adirondack, New York; Kulakoff Award at Albany, New York; Art Garden Community Supported Art Award at Arts Unbound, City of Orange, New Jersey, and the Sojourner Truth Fellowship at New Paltz, New York. Born in New York, Solimanto has received her BA in English Literature and Fine Arts, from SUNY Albany in 2013, and received her MFA in 2015 from SUNY New Paltz. She currently lives and works in Jersey City area.